Flowers Gallery has announced the photographers who'll be featured in their summer show titled Uncommon Ground and curator Chris Littlewood has chosen a really great mix of photographers: Peter Ainsworth, Edward Burtynsky, Chris Engman, Andrea Galvani, Andy Goldsworthy, Scarlett Hooft Graafland, Nadav Kander, Jason Larkin, Alastair Levy, Jaehyo Lee, Tom Lovelace, John MacLean, Robert Polidori, Simon Roberts, Aaron Schuman and David Spero. Burtynsky's series OIL is currently headlining The Photographers' Gallery re-opening and Roberts has a solo show as part of the London Festival of Photography next month but there's a couple of other photographers who I'd like to point out: Andrea Galvani and Scartlett Hooft Graafland both of which I interviewed for Phaidon.com earlier this year. I thought I'd run a few excerpts from each interview - Scarlett Hooft Graafland's is below and I'll put up Andrea Galvani's later so be sure to check back. Scarlett Hooft Graafland's fantastical, but wholly realistic photographs seem like spontaneous moments conjured from a magical imagination. Salt flats are turned into carpet, bowler hats are strung across a smoke filled valley, antlers line up on a frozen lake and a spiral of white balloons floats on a lake echoing Robert Smithson's land art piece Spiral Jetty. "Spontaneous photos can only happen when you stay in a place for some time. 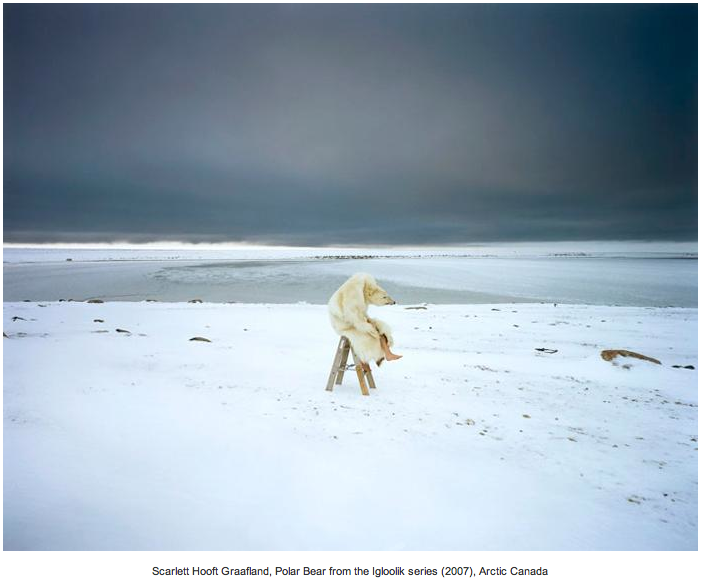 Like the polar bear photo, a performance I did wrapped in a polar bear skin," Graafland says. "I saw the skin hanging outside a house, the hunter, an old woman, killed the animal a few weeks before. I wanted to have the immense grey sky, the heaviness of it. At the horizon you could sometimes see a stripe of white light, so we waited for many days before the circumstances were right; the grey sky, the sea ice just freezing up in the background. The temperature was extremely low that day, minus 25, so right after the photo was taken I had to put on caribou skin boots and jump to get feeling in my feet again." 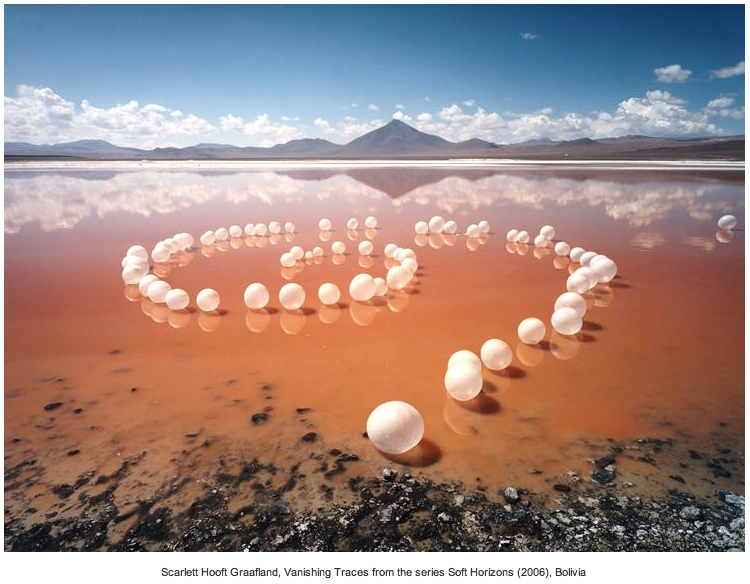 Graafland chooses to travel for long periods of time for her work, often in places such as Bolivia - she spent eight years going back and forth - Laguna Colarada and arctic Canada. 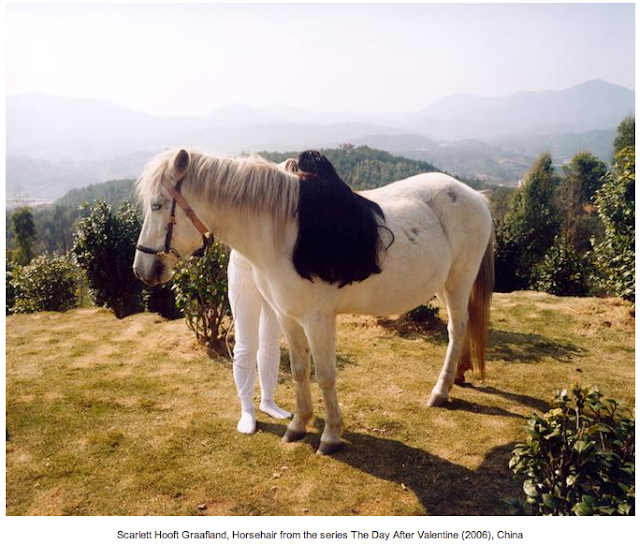 Inevitably after spending long periods of time living in these places Graafland's works become influenced by local art, custom and legends as with her series The Day After Valentine, which she photographed during a stay in Fujian Province, China. "A Chinese legend tells the story of seven girls living in heaven," Graafland says. "Only once a year, on Valentine's Day these girls come down to earth on the head of an ox. One of the girls falls in love with a farmer and decides to stay on earth but the others leave again for heaven."